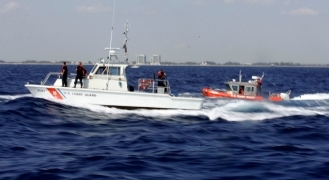 File image of Coast Guard rescue crews. Coast Guard rescue crews scoping the water in and around Rio Vista late Friday night and Saturday morning were able to locate three missing jet skiers. A 36-year-old male, 22-year-old female and 10-year-old girl left Brannan Island State Park on a jet ski around 8 p.m. Friday night, but did not return, according to the Coast Guard. A local resident's call into the Coast Guard Saturday morning revealed that the three missing jet skiers were stuck on a sandbar, according to the Coast Guard. No injuries were sustained and all three people were found to be in stable condition, the Coast Guard said.